The letter H inspired fourteen hearty Indian flavors! Last week, a lot of entries celebrated G for Green. Well, this week, the green theme continues, because green in Hindi is hara, an H word! One popular hara food is the hara chana, fresh tender green chickpeas that are smaller than their better-known yellow counterparts. One of the most popular preparations of hara chana is a street food: chickpeas tossed with onions, tomatoes and spices. We have two delicious versions of this dish that can be made right in your own home. Sushma of Recipe Source makes a crunchy and healthier-than-street-food version by tossing together hara chana with some freshly roasted papad in her Hare Chane ki Chaat. Nice touch, Sushma! We have another delicious version of Hare Chane ki Chaat from Richa of As Dear As Salt. Richa also shares a great story about an enterprising vendor who sold this street food in Bombay: he could teach marketing gurus a thing or two! Hara chana is called harbara in Marathi, and Swapna of Swad uses the dried version of these little beans to make a flavorful and nourishing curry called Harbaryachi Usal. A second popular hara vegetable is the hara pyaz or green onions! Green onions are cooked with an aromatic spice powder into a traditional dish, Hare Pyazwali Gojju by Asha of Foodie's Hope/ Aroma. Read the post for the story behind this dish! The next hara food used liberally in Indian cooking is herbs. Lakshmi of Veggie Cuisine makes a spicy green paste of cilantro and green chillies and uses it to dress up roasted potatoes to make Hara Alu, with delicious results. Shivapriya of My Cookbook takes India's most popular herb, the hara dhaniya patta or cilantro, and blends it into a green chutney that dresses up a crunchy Hara Bhara Bhel. Bhel is an ever-popular street food in India and this home-made version is sure to be a crowd-pleaser! 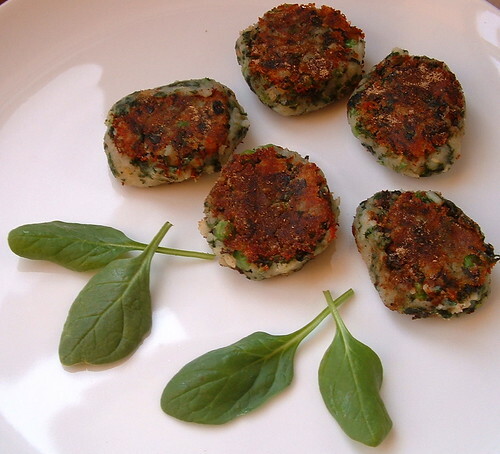 A wildly popular appetizer often seen on restaurant menus is the hara bhara kebab (translates are kebab filled with green). This vegetarian version of the kebab is filled with green goodies like green peas and spinach, as Manasi of A Cook At Heart shows in her mouth-watering recipe for Hara Bhara Kebab. Sig of Live to Eat also gives us her version of Hara Bhara Cutlets, dressing them up with lots of vegetables, including french beans, spinach and peas. Sig's cutlets are a oft-requested dish at her dinner parties, and they look golden and delicious. Next, we have two delicious and unusual-sounding H foods! Sheela of Delectable Victuals takes the exotic route by cooking with some hearts of palm! Sheela was craving a curry that traditionally uses "banana plant stem" but creatively substituted it with some hearts of palm to make Hearts of Palm Molagootal. When Linda of Out Of The Garden said that she cooked with hyacinth beans, I did not think these beans were familiar to me, but a look at her post reveals that this is another name for my beloved vaal beans! As usual, Linda came up with a unique flavor profile, pairing these beans with some exotic coquito nuts to serve up a dish of Hyacinth beans with Shallots and Coquito Nuts. Bee and Jai of Jugalbandi give a beautiful and engaging description of Kashmiri cuisine and make a traditional Kashmiri dish using collard greens, an aromatic stir-fry called Haak. Anjali of Anna Parabrahma vividly describes the rituals surrounding the festival of hrushi panchami and makes a traditional vegetable dish that is startling in its simplicity, a nutritious curry called Hrushichi Bhaji. 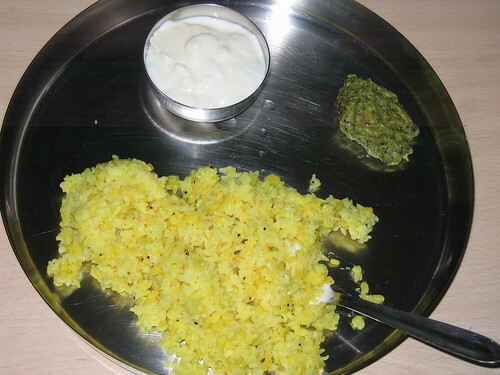 Suma of Veggie Platter makes a traditional dish using the bitter gourd, called hagalakayi in her language, Kannada. She uses the bitter gourd for an authentic sweet-and-spicy Hagalakayi Gojju. I love ‘Hirave Tamato’ (Green Tomatoes). And don’t miss a chance to buy them when I find a fresh lot. There are just 2-3 recipes I have tried with these, but this green tomato chutney is a favorite with us. The tangy sour green tomatoes, minced in a chutney together with garlic and a good kick of green chillies is just the thing to charge your taste buds. It goes well with any kind of parathas, as well as a condiment with your meals. It does stay good refrigerated for 2-3 days. 1. 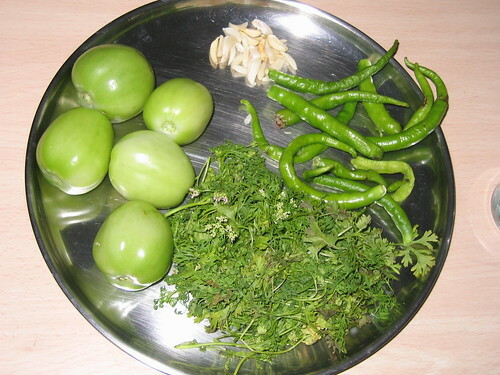 Take 3 medium sized green tomatoes, medium hot 8-10 green chillies, 10-12 garlic pods and a handful of cilantro. (You might need to change the quantities of chillies and garlic according to your taste, more the hotter!!). 2. Wash the tomatoes, chillies and cilantro. 3. Chop the tomatoes in big chunks. No need to chop chillies, garlic or cilantro. 4. Heat 2 tbsp of oil, add mustard seeds. When they splutter, add half a spoonful of whole jeera. 5. Add chillies and garlic together, follow it with the tomatoes in about 5-10 seconds. Cover and let this all cook (Till the tomatoes are just a little bit cooked and not at all pulpy). About, till the water from the tomatoes dries up a bit, caramelizing with it the chillies and garlic. Do remember to switch on the exhaust. 6. Once we reach this stage, remove from stove and stand it to cool a bit. While it cools, add salt as per taste and a little bit of sugar. When the contents are still a bit warm, add the cilantro and mince all this together. When you open the grinder, the spicy whiff will say it all :). 7. That’s it, the chutney is ready!! 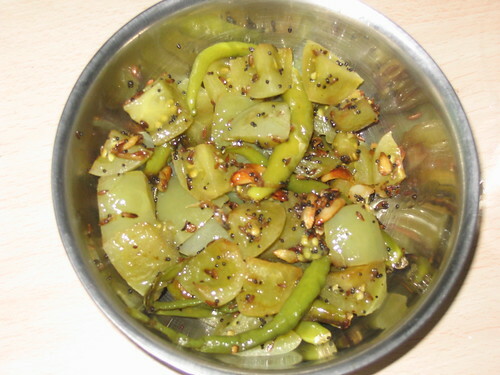 This chutney could also be made using ridge gourd as substitute for green tomatoes. Again delicious!!" I'm dedicating my H of Indian Vegetables to appetizers! Let the chocoholics crave their desserts; me, I can forgo dessert any day to make a meal of appetizers. Much to my delight, the contributions today have already set the stage for a meal of appetizers...we already tasted some chana chaat, bhel, kebabs and cutlets today. Indians take their appetizers seriously. Technically speaking, I should not even be calling them appetizers, because traditional Indian meals are rarely eaten in the sort of "courses" where the appetizers are served as a separate part of the meal. Instead, we enjoy our appetizer-like snacks in every way and all the time. We eat them on the go (in lunchboxes and as street food), as a tasty side-dish with meals, and most definitely at tea-time, when snack-cravings reach a crescendo! Some of the most well-known vegetable-based appetizers are deep-fried goodies: pakodas are made by mixing shredded vegetables (cabbage, onions, greens) with chickpea flour and deep-frying little morsels or alternatively, by dipping slices of vegetables (potato, eggplant, green pepper) into spicy chickpea batter and deep-frying them. Samosas are little pastries typically enfolding a tasty mixture of potato and peas. Another category of appetizers are called chaat, a large heterogeneous family of savory snacks that have a few things in common: (a) they are spicy and tangy, always an explosion of flavors; (b) they are commonly sold as street food all over India; (c) once you taste them, you are sure to get hopelessly addicted! When you devour chaat, you are succumbing to the allure of taste, and nutrition is not high on the list of priorities, but the truth is that more often than not, these snacks feature the fresh flavors of cilantro, onion, tomato, green mango, etc., and often feature beans (like green chickpeas, hara chana) and vegetables. Just check the links of fellow bloggers below for some wonderful examples. I thought H was a pretty difficult letter (I've just been proven wrong by the creative contributions above!) and came up with an appetizer called Hariyali Tikki. Green in Hindi is hara and hariyali translates as greenery. Tikki, I think, refers in general to a round flat shape, and when appetizers are termed tikki, you can be sure you will be served little flat, round morsels of something spicy and delicious. Hariyali tikki is a non-specific mish-mash of green vegetables like spinach and green peas, held together by mashed potato and spiced with ginger, garlic and chilies. The mixture is fried into little patties. I love dredging the tikkis in some chaat masala right before serving them. Chaat masala is a store-bought mixture of all those tangy spices that go into chaats, and it gives the tikkis some extra oomph. You will see that the hariyali tikki recipe is very very similar to the hara bhara kebabs above; all tricky little ways to take some every-day vegetables and transform them into something tasty that everyone will devour! 1. Boil 3 medium potatoes. When they are cool enough to handle, peel them and place in a bowl. 2. Cook 2 cups washed spinach. I like to do this in the microwave for a couple of minutes. The water droplets clinging to the spinach provide enough steam for cooking the spinach, I find. Press away any excess water from the cooked spinach, chop and add to the potatoes. 3. Add the following to the potatoes and spinach: 1/2 cup green peas, (frozen works fine), 2 tbsp minced cilantro, 1 heaping tsp kasuri methi (dried fenugreek), 1/2 tsp ginger-garlic, paste, 1 green chili, minced, salt to taste. 4. Mash the mixture together and shape into small oval patties in your palms. If the mixture does not hold together, you may need to sprinkle a tsp or so of cornstarch into the dough. 5. Heat 2 tbsp oil in a skillet (I use a non-stick one) and shallow-fry the patties until golden brown on each side. 6. Sprinkle the patties with chaat masala, and serve hot with ketchup or tamarind chutney. 1. This can be a total vegetable-crisper-cleaning recipe. Cook and mash any left-over bits of vegetables and fold them into the tikki. 2. Make stuffed patties for a more festive appetizer. Two ideas for stuffings: a cilantro-mint chutney, and a cheese filling using shredded paneer or any other cheese. 1. As an appetizer for any Indian meal. 2. Make mini-patties and serve on toothpicks as a cocktail snack. 3. Make larger patties and serve in a burger bun as a veggie burger with a difference! 4. Serve with a chickpea-curry (chana) topping as a chaat (tikki chana). Pakoras from The Traveler's Lunchbox. Aloo Tikki and Corn Bhel from Sailu's Food. Palette of Chutneys from Saffron Hut. Thank you for this wonderful blog, I am a hopeless addict! hi Nuour, thanks for a beautiful roundup! such a coincidence that we have so many "hara" recipes and yest was St. Patrick's day! What ingenuity ! I thought 'H' was such a difficult letter of the alpabet for names of Dishes but once again, Nupur , you suprised us. Hriyali cutlets have always been a hot favorite of mine and i cannot praise you enough the way you have presented it. 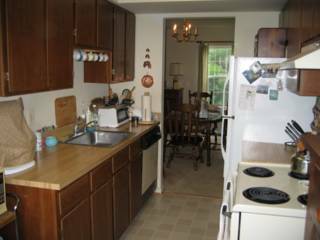 It is the style of the language and the presenetation which makes 'one hot stove' a scene stealer. Also Huliannam from Mysore - Bisi bela huliannam , a popular rice and dhall dish from Mysore ? very fascinating Alpabet food series - keep up the great work! the kasoori methi is is a great addition. it takes it to a whole new level. Wow Nupur, this A-Z thing has turned into quite an ambitious project! With a round-up of the letter entries as well as a round-up of earlier posts featuring similar food, AND your own recipe, you're building quite a resource. As always, your H recipe sounds delicious! Great round up Nupur!Thanks for not putting up my story!HeHe!! 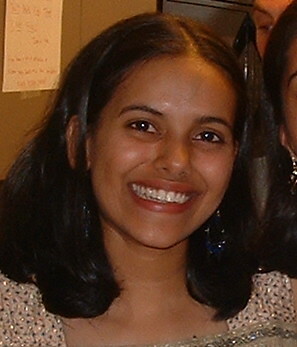 Smita, what a nice thing to say! Thanks for being so encouraging! Linda, Aww, that was unfair that you did not know the hindi words! But seriously, the way you have mastered Indian cooking, you will learn Hindi in a couple of months if you try! :) I love that val beans are called hyacinth beans! Anon, thanks for the kind words! Halwa is certainly one of my favorites, and it is true, one can make halwa with lots of different veggies! Bee, I love the complex taste of methi and having no access to the fresh leaves, kasuri methi is the next option! Cathy, it is so much fun with all these wonderful contributions :) And yes, I love having all these links in one spot for easy reference! This was great! Easy to make, healthy and most importantly absolutely divine. I made the patties - hogged on a few the very same day and have stored 4 (uncooked) patties in the refrigerator. This evening, when I go home, Ill hog on those - I get so hungry after work. Couldnt get a healthier quick evening snack. Here is another patty that I tried and loved recently: sweet potato tikkis. I tried your Hiravya tamatyachi Chutney, It was yum yum..... thank you so much. I also served it with tacos as a taco topping and a link to yours. Thanks.